For all of the nerds out there, including me, today is international Pi Day, the day when we celebrate our favorite mathematical constant. 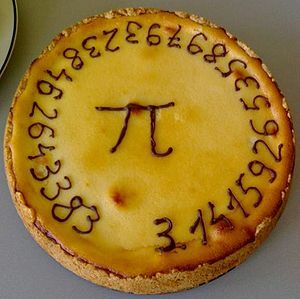 Pi Day is best celebrated by pi memorization contests, walking in circles, and, of course, eating pies, or is it pis? I think I will celebrate by writing a little about pi. Pi or π is, as everyone should know, the ratio between a circle’s diameter and its circumference. Pi is an irrational number. By this, they do not mean that pi makes no sense but rather that pi is a constant that cannot be expressed as a ratio of two integers. Numbers like 2 or .445 or 1/2 can be expressed as a ratio of two integers and so are rational. Numbers like pi or the square root of any number that is not a perfect square, the square root of 2 for instance, are irrational. An irrational number expressed in decimal form never ends or repeats but continues to infinity. Thus, there can never be a last digit of pi. The symbol π was first by the mathematician William Jones in 1706 and was popularized by another mathematician, Leonhard Euler. They chose π, the Greek equivalent of the Latin letter p, because it is the first letter of the word periphery. Π, by the way is not pronounce “pie” in Greek but “pee”, just like our p. I don’t think that international “pee” day would be nearly so appealing. Although the symbol for pi is relatively recent, the concept is very old. The ancient Egyptians and Babylonians knew about it. Pi is even mentioned in the Bible. Properly speaking, the line around the “Sea” should have been 31.5 cubits but the ancient Hebrews were not very knowledgeable about geometry and measuring techniques were crude. There is no particular reason to calculate pi to so many digits. No conceivable application of pi would possibly take more than 40 digits. Still, the challenge of calculating pi to the farthest digit possible has been an irresistible one for mathematicians over the years. Around 250 BC, Archimedes was the first mathematician to seriously try to calculate pi. He used a geometric method of drawing polygons inside and outside a circle and measuring their perimeters. By using polygons with more and more sides he was able to calculate pi with more precision and ended determining the value of pi as somewhere between 3.1408 and 3.1429. Archimedes’s method was used in the west for more than a eighteen hundred years. The Chinese and Indians used similar methods. The best result using the geometric method was the calculation of pi to 38 digits in 1630. With the development of calculus by Isaac Newton and Gottfried Leibniz in the 1660’s it was possible to calculate pi using infinite series, or the sum of the terms of an infinite sequence. The best calculations with these methods were done by the mathematician Zacharias Daze who calculated pi to 200 places in 1844 and William Shanks who spent fifteen years to calculate pi to 707 digits. Unfortunately he made a mistake with the 528 digit. Meanwhile, in 1761 Johann Heinrich Lambert proved that pi is irrational. Computers made the calculation of pi much faster so pi could be calculated to more digits. ENIAC calculated pi to 2037 places in 1949. This record didn’t last long. A million digits were reached 1970. As of 2011, pi has been calculated to 10,000,000,000,050 places. Pi is not just used in geometry. There are a number of applications of pi in the fields of statistics, mechanics, thermodynamics, cosmology, and many others. Here is a list of just some of the formulae that use pi. It seems you can find pi everywhere. With that in mind then, happy pi day! For your enjoyment here are the first thousand digits of pi.